How I got hit by a car. again. Having survived my previous pedestrian encounter with a car, I continued walking to school until the completion of third grade, where a redistricting moved our neighborhood to a different school that was too far for walking, so I joined the bus brigades for the remaining three years of elementary school. I was also a bus rider for my 7th grade year at West Junior High, and my 8th grade year at West Middle School – things are always changing, aren’t they? I entered Rochester High School as a freshman, and once again, returned to the ranks of the kids who were turned loose in the early morning darkness and supposed to find their own way to school without finding any trouble along the way. Trouble, find me? Never. This was our second trip on AirTran, after our trip out east this summer. We upgraded to business class both ways when we checked in online for our flights, and it was worth every penny. We picked the first row on both flights, and it worked out great to have the extra room for Leah, and the endless animal crackers for Aly. The crews on both flights were polite, friendly, and engaging, which is a nice departure from what we had been accustomed to flying NWA and Delta over the years. Aly got to spend quite a while in the cockpit on both ends of the southbound leg, and another good chunk of time in the cockpit upon our return to GRR. 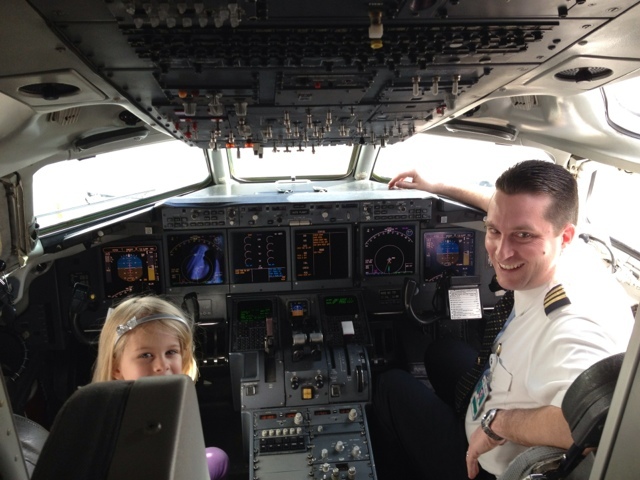 The pilots were great with her in both instances, and she absolutely loved it – can’t say enough good things about AirTran at this point. 10/10 for air travel. We all hit the sack pretty early last night, and Leah once again decided she couldn’t wait to spend more time with her parents, so she and I wandered out before 7am. We started by taking the elevator up to the 15th floor of Bay Lake Tower and taking in the pre-sunrise views of Magic Kingdom, the Contemporary, and Bay Lake. We then headed down to the fifth floor to take the skybridge across to the Contemporary proper, so I could see out some breakfast. The Contempo Cafe wasn’t open yet, so Leah and wandered over to the bar outside Chef Mickey’s and hung out for a while. Once Contempo opened, we ordered my breakfast on the touch screen (Mickey Waffle with Banana Caramel Syrup, turkey sausage, bacon) and got her some apple slices to chew into little pieces and then spit out – she’s like one of those mincing gizmos. Waffle good, bacon good, turkey sausage, um, well, there’s a reason that sausage is supposed to come from pigs and not turkeys, let’s just leave it at that. Even my caramel syrup couldn’t make that taste good. After I ate my breakfast and Leah finished decorating the carpet with minced apples, we headed back over to the BLT and went outside to visit the pool area. It seemed like a pretty cool pool area, great slide, and a large padded splash area for kids and babies, with fountains and other spraying thingies. We also walked the jogging path around the hotel and then headed back up to wake up the other two.